Mangoes here, mangoes there, and mangoes every where! Here they are tightly packed in a wooden cartoon. Here they are pickled and brined to perfection. It’s a season of Mango Mania. It is and it will always be mangoes that rule my world and my childhood memories. Forget all exotic fruits- pineapple, peach, kiwi, plum, berries; nothing can ever come quite close to magnificent Mangifera Indica in flavour, taste or aroma. It’s a same story every year. Just one look at them and I start reminiscing about the Mango Season, the season of the king of fruits, back home in India. Come summer and it meant only one thing for me and my sister, long vacation at Paternal Granny’s home. The memories of those sunny, glorious summer days of endless fun, pranks and digging our teeth into succulent mangoes warm my heart even today. Granny’s house was just like many other beautiful tiled-terraced houses (or more like mansion) in my native Mangalore. Surrounded by acres of greenery, the white house with red tiles stood tall and proud with wide porches running around the house. Polished to perfection red oxide floors would gleam with intricately carved round rosewood pillars supporting the roofs. The trees around the big house served as the compound walls and the beautiful water stream flowing right next to the house was its gate. Magnificent jackfruit, tamarind, coconut trees competed against each other for the title in the backyard. Amidst them was this garden from heaven, Mango Orchard. No idea as since how long it’s been there. It was just like my great grand father knew that his numerous great grand children, like hungry flocks of birds, would come and attack the mangoes while they were still green, tender and sour. Just one look at those luscious gold and emerald coloured fruits hanging from green leafy trees was enough to get us all excited. Every summer it was the same story as if we were looking at the mangoes for the first time. There’s always something special about mangoes. It is like seeing the gold rush, precious to every kid and even grown up. Always trying to suppress the innate urge to monkey around but failing miserably, all we kids were seen hanging from the mango trees while the grownups snored through the hot summer afternoons. While older kids, especially the boys, climbed the higher branches we smaller kids would be seen hanging from the lower branches of the trees. And the ones who were scared of height were seen standing on the ground holding a big bath towel spread wide to collect the mangoes picked and thrown by the ones on the trees. Biting deep into raw sour mangoes and dipping those pieces into the spiced ground mixture of salt, pepper and red chillies wrapped in an old newspaper sheet was pure heaven. If that was not enough, each and every meal served during mango season had one or more mango dish to tingle our taste buds. Tender Mangoes ground with Sweet Coconut Chutney, Tender Mango Pickle, Mango Dal, Mango Burfee, Mango Palya, Mango Mosaru Gojju, Mango Rasayana, Mango Rice, Mango Lassi are few of them which were served with dollop of love everyday. While listening to stories of Devas (God) and Asuras (Demons) from Ajji, the intoxicating perfumes of the mango flowers wafting from backyard would sooth our senses and lulled us into deep sleep. Blissful childhood days and glorious mangoes!!! This year during our short trip to India we did manage to gulp down few mangoes and recreate our childhood memories with little nephew and niece and half a dozen other kids from neighbourhood. And if you are wondering did I really climb the mango tree with them, then I am not going to disappoint you guys. Yes, I did climb the mango tree with my sister and brother just two days before my sister got married and managed to get scolding from our neighbour who happened to be the owner of that gorgeous mango tree. Well, something just can’t be changed! With all these I did manage to eat all delicious food cooked by my MIL (can’t believe I am one of those lucky people who have this generous, sweet soul as MIL). Out of few recipes I managed to learn from her during busy schedule was this delicious Spicy Mango Chutney or Instant Mango Pickle. 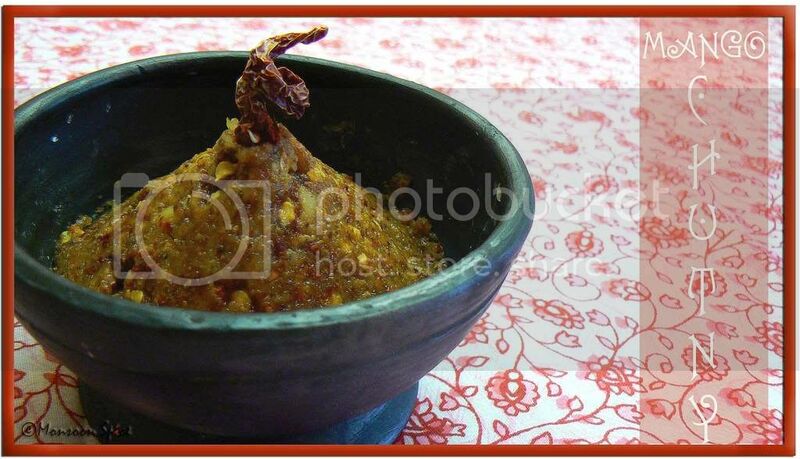 Slightly sweet and sour Tothapuri Mango is grated and mixed with salt to remove excess juice and then ground with few spices to make this very fresh, aromatic and spicy pickle/chutney. If you don’t get Tothapuri Mangoes then you can easily substitute it with any other sour raw mango of your choice. I am dedicating this mango post to my gorgeous sister who was not only my trusted companion in stealing mangoes from our neighbours but also is celebrating her birthday today. S, this is for you my dearest. And straight away it goes to dear Arundathi who is guest hosting this month’s WBB-Mango Madness started by Nandita. While we are still talking of Mango Mania, don't forget to share your Mango memories with us. Mix sea salt with grated mangoes and keep it aside covered for about ½ and hour to hour time. The juice from mango will be released. Squeeze the juice from grated mango and reserve it for later. Keep aside squeezed mango gratings. Dry roast dry red chillies, fenugreek seeds, mustard seeds and hing in a pan on medium to low flame for about 2-3 minutes till fenugreek seeds turns light brown in colour and you get nice roasted aroma from spices. 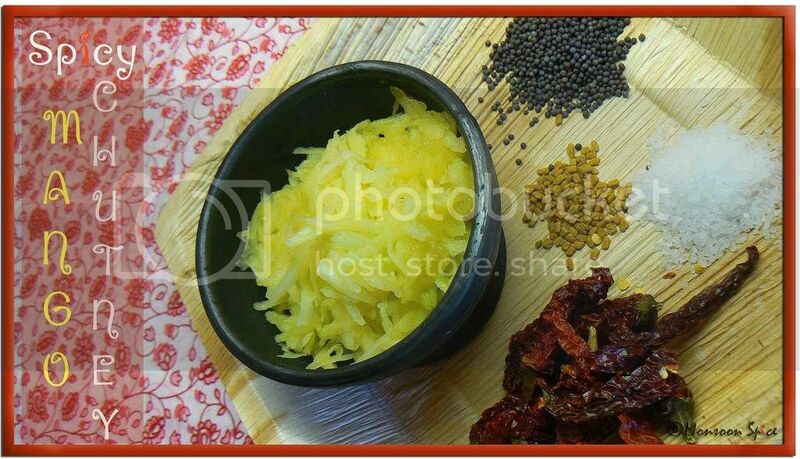 Cool the spices and grind them coarsely with grated mango. Add reserved squeezed mango juice as and when required. This Pickle/Chutney should be quite thick in consistency and make sure that you don’t grind them to smooth paste. Store them in a sterilised jar in refrigerator. It can be used up to a month’s time. Serve them with Dosa, Idli, toast or Curd Rice and enjoy. You can also add 1 tsp roasted Cumin Seeds/Jeera for little different flavour. Make sure that you don’t grind it to smooth paste. It should be ground coarsely so that you can enjoy small chunks of spices and mango. Tothapuri mangoes work best for this recipe. But if you don’t get them at your place then you can easily substitute it with any other sour, raw mango of your choice. First of all, lovely poem! Kudos to Poet Sia! The chutney looks awesome. Love the mountain-shaped presentation with a chili flag on top. I can almost taste this chutney. Agree with you on the totapuri bit, that is what this chutney calls for. But I recently found that tart granny smith apples work just as well. 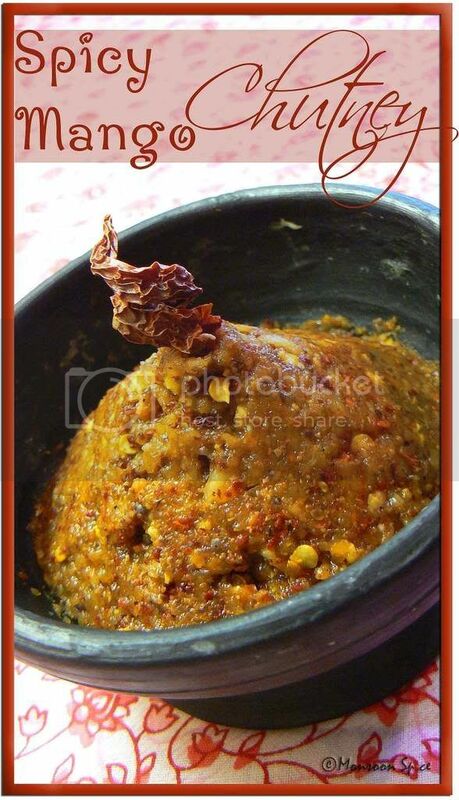 The spicy mango chutney is too tempting...the more I look at it the more I yearn for it ! Simply stunning, as always. I am always awed by your photos and recipes. Sups!! You can't finish all of it without sending some over. I love everything about Mango. Guess what, I have two big raw mangoes in my pantry now. We went over to friends at Croydon and bought some veggies,they are still patiently waiting for me to pick them up. oh sia!! what a wonderful trip down memory lane....i think most memories of mangoes are associated with childhood....and that's what makes the pleasure double.....lovely entry for WBB....thanks!! see you at the roundup!! oh you make me blush :) thank you. he he... and yes, mangoes are always special part of growing up in india. grrr... u just had to say that and make me J, right? Looks like you and I have similar memories Sia. I love love love mangoes. We had many trees in our yard and I have fond memories of eating them in summer. We too make a similar pickle and its one of my favorites. Your pics have come out beautiful as usual Sia. Mango revealed a good poet! I want the spicy pickle right away Sia. Love the presentation! Lovely poem and description of the good old days back in India. We atleast have our memories to cherish for the rest of our lives. But I feel very bad for our kids, who cannot have similar experience. Very good chutney too. It's one of my grandmother's speciality. It's long time since I made this. Now you have reminded me and I have got to make it ASAP. Lovely poem sia :) Ofcourse chutney super...again pics are too good. Kudos to you, Madam Sia Wordsworth!! Great job for poem and chutney both. Sia..lovely poem.. and this is a nice and simple recipe and im already imagining the chutney with curd rice hmm.. so yummy..
Mango mania is absolutely right & your poem ROCKS!!! I remember the tothapuri aam back from my school days down South in Bangalore. the North is flooded with safeda aam these days, with the langda & dassehri creeping in. mango rules the roost & you are right...nothing to beat the KING OF FRUITS!!! Great great recipes & it's lovely to see you share them!! Have a great weekend and be safe, see you on Monday! yum! that chutney looks delicious sia..and WTG on climbing up trees..has been a while i have done that myself! Fabulous memories Sia and the chutney, an all time favourite. I truly miss Thothapuri here. What a lovely mango chutney. I'm still looking for thothapuri mangoes and I'm getting them this week. Nice to meet you Sia wordsworth :D.